Chicago, IL - The annual meeting of the Central Church Council of the Serbian Orthodox Church in North and South America was held at Holy Resurrection Cathedral in Chicago December 10-11, 2010. The host for this year’s meeting was His Grace Bishop Longin in has capacity as deputy for the Administrator of the Libertyville-Chicago Metropolitanate, His Holiness Serbian Patriarch Irinej, together with the clergy and church board of the Cathedral. The Central Council is composed of the diocesan bishops and clergy and lay representatives from each of the dioceses of the Serbian Orthodox Church in this hemisphere. The meeting was opened with prayer by his Grace Bishop Georgije of Canada who, by direction of His Holiness Patriarch Irinej, presided as the senior hierarch by consecration of the Serbian Orthodox Church here. He greeted the participants and expressed his hope that their work would be successful for the good estate of our Holy Church. Present at the meeting were, in addition to His Grace Bishop Georgije, Their Graces Bishops Longin of New Gracanica-Midwestern America, Mitrophan of Eastern America, and Maxim of Western America. All clergy and lay delegates were present from the Libertyville-Chicago, Eastern and Western Dioceses. One representative was missing from the New Gracanica-Midwestern Diocese, while Bishop Georgije was the sole representative of the Canadian Diocese. Central Treasurer Brian Gerich reported that all dioceses had met their financial obligations to the Central Treasury regularly, allowing the prompt payment of all bills. The monthly stipend for clergy widows of $450 per month was paid regularly and on time. The administrator of the clergy Pension Fund, V. Rev. Stavrophor Dragoljub Malich, presented his report to the Council. There are presently 93 active and five inactive members in the fund. The investments in each priest’s account are self-directed in the various financial options available through the Mutual of America Company. Each clergyman and parish is required to contribute to the Pension Fund. The Administrator of the clergy Health Insurance plan, Protonamesnik Milovan Katanic, presented a written report on the plan. The Serbian Orthodox Church participates in a group plan through Aetna Insurance with clergy of several other Orthodox jurisdictions, with the larger group providing protection against large hikes in prices. We have 19 priests in the full plan, with 16 covered under the vision and dental plans. Family coverage costs $1,720 per month, with single coverage at $815. The Central Council decided to increase the life insurance the Church supplies for each priest by paying a premium of $150 per year. The Central Church has its own website, www.serborth.org, with Protonamesnik Milovan Katanic as web master. The chairman of the Theological School Foundation Dr. Branimir Simic-Glavaski presented a written report on the financial status of the Foundation. All congregations are asked to participate in the work of the Foundation, which provides financial assistance to the St. Sava School of Theology in Libertyville, IL for the training of our future clergy. The Editorial Board of the Path of Orthodoxy, the official publication of the Serbian Orthodox Church in North and South America, presented its report. The newspaper appears monthly, usually in 12 or 16 pages, in both English and Serbian language sections. English editors are Prota Rade Merick, Prota Bratislav Krsic, Protonamesnik Milovan Katanic, and contributing editor Archimandrite Thomas (Kazich). Serbian editor is Prota Nedeljko Lunich, and technical editor is Vesna Meinert. The Path and the internet website function as part of the Church’s Standing Committee for Communications and Publications. The Central Council directed the Path editorial board to explore the possibility of distributing the Path through electronic mail, beginning with those such as the clergy and parishes whose electronic addresses are readily available. Each issue of the Path of Orthodoxy is currently available for download in electronic format on the central church website. The Path editorial board is presently also working with the diocesan offices to update the Path mailing list, in particular including former New Gracanica Metropolitanate parishes which may not have previously received the newspaper. All parishioners in good standing are entitled to receive the Path as a benefit of their membership. The 2011 budget for the Theological School at Libertyville was approved with reduced expenditures. The importance of the School was emphasized, as over 50 of its graduates have been ordained for service in the Serbian Orthodox Church. The School is funded largely through the generosity of individual voluntary donors, with the remainder supported by the Central Church treasury. Following the repose of His Eminence Metropolitan Christopher of blessed memory, the School’s Faculty Council elected His Grace Bishop Dr. Mitrophan, a professor at the School, as Dean. Gratitude was expressed for Metropolitan Christopher’s immeasurable contributions to the Theological School, especially in regulating its academic status and obtaining accreditation for it from American educational institutions. Last year the Nikolic Fund, now the St. Sava School of Theology Scholarship Fund, was transferred to the oversight of the Central Church Council, with Metropolitan Christopher as trustee. After the Metropolitan’s passing the administrative board of the Central Council appointed Father Aleksandar Novakovic, secretary of the School, as temporary trustee. On the advice of legal council the Central Council adopted the documentation of the Fund with the change of name and naming the members of the Episcopal Council together with the School’s Dean as trustees. 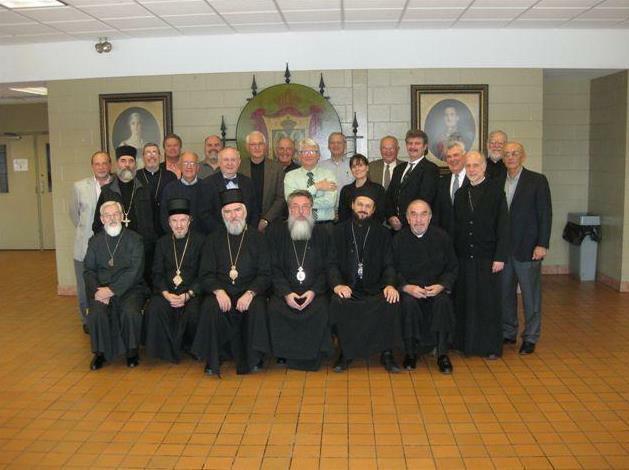 Concerning the status of the Libertyville-Chicago Metropolitanate, the members of the Episcopal Council (the Serbian Orthodox Diocesan Bishops in the Americas) informed the Central Council that this question, along with others, would be decided at the next Holy Assembly of Bishops in May 2011, on the recommendation of the Episcopal Council in accordance with the Constitution of the Serbian Orthodox Church in North and South America. The Central Church Council discussed the possibility of moving the School of Theology to New Gracanica Monastery because of more suitable accommodations there. It was recommended that Bishop Longin as the hierarch of New Gracanica Monastery and Bishop Mitrophan as Dean of the School, along with the other members of the Episcopal Council, study the feasibility of such a move and make the necessary decision. On the question of Canadian Diocese assessments to the Central Treasury it was decided that, since the Canadian Diocese does not benefit from some items of the Central budget, that Diocese should be released from payment of these assessments, but that it should continue to contribute to the School of Theology. Attorney Thomas Karacic gave a report on and explained certain current lawsuits. The director of the Standing Ministry Committees of the Central Church, Prota Stavrophor Nikola Ceko, reported the work of these committees. These Committees include: Christian Education, Communications and Publications, Youth Ministry, Serbian Language and Culture, Stewardship, Church Music, Young Adult and College Student Ministry, and Marriage and Family Ministry. The Committees meet together to share their work twice annually, with the individual committee members meeting more often in person or by teleconference. The report on the work of the Standing Committees was welcomed by all present. The Council decided to print 1,000 copies of the Uniform Rules and Regulations for distribution to clergy and congregations. Fathers Nikola Ceko and Darko Spasojevic were tasked with developing forms for excerpts from the church’s metrical books (records of baptisms, funerals, marriages and conversions) which will be distributed for use by all parish and congregation administrations. The need for uniformity in administrative and financial procedures was discussed. A committee was formed to recommend assessment rates payable to the Central Treasury by each Diocese in the United States, based on the number of parishes and members and the income and expenditures of the congregations of each Diocese. The committee is composed of one member from each diocese concerned: Brane Brankov, Milan Visnick and Brian Gerich. The Central Council adopted a budget for 2011 based on the following assessment rates for each Diocese: New Gracanica-Midwest, 42%; Eastern America, 35.5%; Western America 22.4%. Bishop Georgije pointed to the importance of our church unity. Our unity is reflected not only in business matters through the Central Council, but also in our communal canonical and spiritual oneness. His Grace Bishop Georgije sincerely thanked the clergy and church board of Holy Resurrection Cathedral for outstanding hospitality.